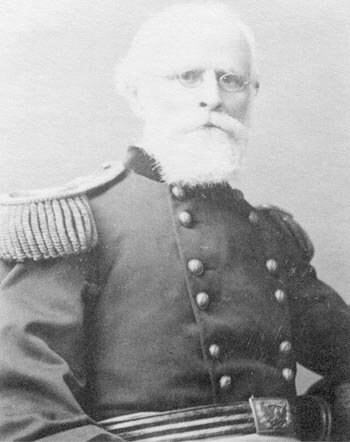 U.S. Army surgeon John B. Porter distrusted all anaesthetics. He prohibited their use in his medical commands. Porter's professed worry about anaesthesia was based on the adverse effects of anaesthetic agents on wound-healing and the allegedly increased risk of haemorrhage that stemmed from their use. But Porter's opposition to painless surgery was also a reflection of the prevailing military ethos of rugged masculinity. Fit young soldiers supposedly did not need - and might even be unmanned - by such a decadent novelty. Porter's later opposition to anaesthetics is nonetheless puzzling. For ether anaesthesia was first used in a military conflict during the Mexican-American War sometime in the Spring of 1847 under the direction of surgeon Edward H. Barton - and Porter himself. In "Medical and Surgical Notes of Campaigns in the War with Mexico" [The American Journal of Medical Science, 23 (1852), 33], Porter claimed that inhaling ether vapour in doses adequate to induce insensibility was highly dangerous. The inhalation of ether tended to poison the recipient's blood, impair muscle contraction, adversely affect the nervous system, and put wounds in "an unfavorable state for recovery". Hospital gangrene, Porter alleged in print, hadn't even existed before the ill-judged introduction of anaesthesia. Prior to acceptance of the germ theory of disease, physicians were apt to confuse post-surgical infection with a delayed-onset effect of the anaesthetic agent used for an operation. Military opposition to the use of anaesthetics in surgery extended far beyond America. In A Calculus of Suffering (1985), Martin S. Perniak cites a (Confederate) Virginia manual of military surgery. The manual reports how England's Sir John Hall (1795-1866), chief medical officer in the Crimea and inspector-general of hospitals, "disparages chloroform, and lauds the lusty bawling from the smart of the knife, as a powerful stimulant". The same manual relates how "Some of the older surgeons characterise the cries of the patient as music to the ear, and speak of it as an advantage to be courted, and not suppressed." Yet the horrors of war injury and battlefield surgery were so terrible that the opposition of Porter and like-minded conservatives to "mistaken philanthropy" was swept aside. Anaesthetics, opium pills and morphine were extensively used by both sides during the American Civil War (1861-65). "Stonewall" Jackson consented to be chloroformed for a limb amputation. Etherization pioneer William Morton himself administered anaesthesia to thousands of Union and Confederate soldiers. In Civil War surgery, chloroform was more popular than ether anaesthesia, in part because chloroform is faster-acting and less likely to cause initial excitement, but also because ether is explosive - a particular disadvantage at field-hospital operating tables at risk from enemy gunfire. After almost three decades of service, Porter retired from the army in August 1862.